My 5 year old Dutch shepherd, Konrad, has an EXCESSIVE prey drive. He is all around an amazing and well behaved dog, who never barks, chews or destroys, and has an amazingly calm and composed demeanor. In our 4 years together, we have found that we are practically able to teach him ANYTHING, except how to stay calm in the presence of anything that runs. When in the presence of any wild animal (or cats) he becomes almost unrecognizable. His ability to listen and respond on command disappears, he gets extremely frustrated and anxious, pulls violently if on a leash, and the adrenaline rush he gets tunes out the world around him. He will lunge and growl at squirrels through the window and has run off on us after deer, coyotes, and bears (which is a terrifying experience). At this point enough is enough. He is our wilderness adventure buddy, and we value his presence on the trail and in the woods, but this behavior is becoming a dangerous and frustrating habit, and as we live in a small cabin in the woods, we need to be able to gain his attention and take control of such situations. He was stray before we adopted him, and is an extremely adept hunter, so our best guess is that he may have hunted to feed himself during his time as a stray, and as a result, the behavior has become ingrained in him. What can we do to stop this behavior, calm his demeanor, and turn his attention toward us when faced with wild animals? 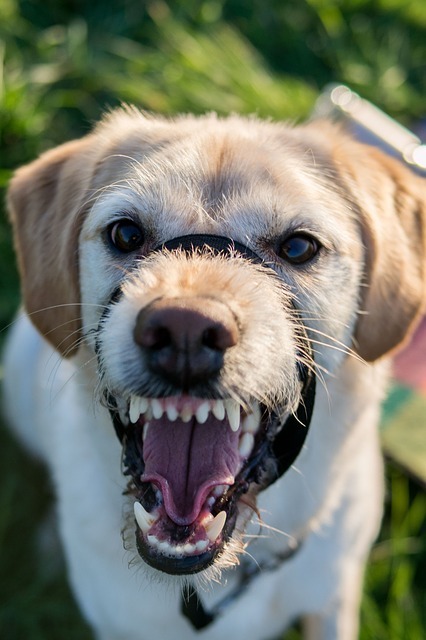 Certified Dog Behavior Consultant Sue Brown has created two excellent resources to help you with your unruly dog: an $11 impulse control online mini-course, and a $67 online dog training course. Both of these options will really help you get started on controlling your dog! Want more personalized help? Check out our different remote and online training options. You can schedule a one-on-one call with me to discuss your dog, or just subscribe to a free Q-and-A text or email service where you get fast answers to dog training questions. Basically, no free access to prey animals. It’s important to note what your dog perceives as a prey item. Dogs that see bears, deer, elk, other dogs, cats, or humans as prey items are obviously much more dangerous than dogs who act out their instincts on stuffed teddy bears, tennis balls, or even mice. No matter what training route you take, don’t forget the importance of practice in dog training! Helping teach a dog to be calm around prey animals takes a lot of practice. You can give your dog healthy outlets for exercise by playing dog training games, and impulse control games. You’ll hear me talking a lot about impulse control. That’s because most of what we humans view as “naughty” dog behavior is actually pretty normal dog stuff. Our job as good owners is to teach our dogs what we expect from them – and then help them work through situations that challenge them. Dogs with poor impulse control are more likely to act immediately on their instincts, rather than slow down and remember their training. Think of it like teaching your dog to slow down and think through their actions. 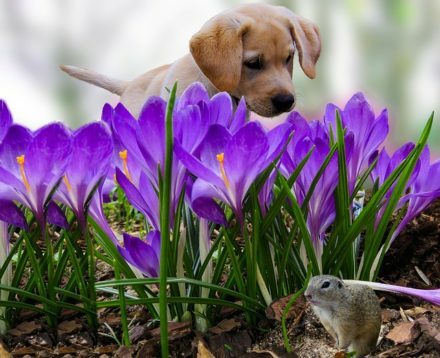 For dogs with high prey drive, this means a dog with good impulse control should be able to look to his owner for direction rather than lunge to chase the squirrel. Try these 9 games to teach your dogs impulse control or these 13 dog training games. Using a variety of these games will give your dog more chances to learn how to slow down, rather than simply react instinctively. You’ll especially find “Ready, Set, DOWN” and “Look At That” useful when working with a dog with high prey drive. So how do you actually go about controlling dogs with high prey drive? Other than strict management, I like to implement “Look At That!” games with dogs with high impulse control. “Look At That!” (LAT) games are common for fearful, reactive, or aggressive dogs as well. Check out my “Ask A Dog Trainer” post on reactivity for more details. The basic idea of LAT is to expose your dog to his “trigger” at very low levels. For Konrad, that might mean having him on a leash across the field from a bird, deer, or squirrel. The goal is to teach your dog that when he looks at the trigger, he gets a reward. Eventually, you start to teach your dog to look at the trigger, then look at you, then get a reward. This rather simple principle works because it teaches the dog what to do when he sees his trigger other than his underlying impulse. Paired with good impulse control, LAT can be a pretty magical training tool. We’ll start easy. Have your dog on a leash in a boring area (like your living room). Use a clicker and some tasty treats or a favorite toy. Have a friend handy. As your friend walks into the room, click and reward your dog for looking at them. Repeat this 10-20 times (at least). This stage is important, even though humans aren’t your dog’s trigger. You’re perfecting YOUR timing and clicker/leash/reward handling skills. You’re also getting your dog into the pattern of seeing something interesting, and then looking back to you for a treat. Get really good at step 3. Then move on to increasingly distracting environments. If your dog is having a hard time remembering to look back at you, go back to step 2 for a while. It’s ok to make a noise to get his attention, but we don’t want to rely on that. We want the look at the trigger, then look at owner sequence to be automatic. For dogs with high prey drive, it might be important to set up some fake scenarios involving prey items to work on this training. Since you can’t control where the squirrels are, this requires a bit of creativity! Want more personalized help? Check out our different remote and online training options. We have something for everyone! It’s also imperative to work on come when called (recall) for dogs with high prey drive. Practice come when called often and in a wide variety of places. Use really high-value rewards (tug toys or fantastic treats). It’s important to make come when called a highly ingrained habit and an exciting cue for your dog to hear. The more you practice in increasingly distracting areas, the more likely you are to succeed in the real world. Read more about teaching your dog to come when called here. Start out making this super-duper easy. That means doing recall training inside your home. Then inside your home with some distractions. Go outside in the fenced yard. Practice outside with some distractions. You get the idea. Be sure to keep an eye on both the Distance and Distraction of your recall training. For example, don’t expect your dog to be able to come when called from a quarter mile away when she’s romping in the dog park just yet. Start out 5 feet away from your dog. Then 5 feet away from your dog near mild distractions. Slowly, slowly move your way up in distraction and duration. Never increase both Distance and Distraction at once! We want to set your dog up for success. That means making it easy. Practice with your dog attached to a long line, especially at first. That way, you can grab your dog more easily if need be. Like working with reactive dogs, dogs with high prey drive need a setup to successfully work on Look At That exercises. While you might be able to go to the local park to use squirrels, their fast movements and unpredictable behavior might send Konrad over the edge right away. Likewise, you might be able to go to a pasture and use horses, goats, cows, or sheep. That might work at first, but dogs with high prey drive also need to work on not chasing fast-moving things. This is where we get creative. I’d suggest trying to use a stuffed animal. A friend can have the poor Beanie Baby attached to a string. With your dog on a leash, start using the inanimate object for some look at that exercises. Your friend can then start twitching around with the toy, making it move. Continue to work on look at that. If your dog starts struggling, make it easier. You can do this by increasing the distance between you and the toy or by making the toy move more slowly. Eventually, build up to the Beanie Baby flying through the air, “scampering” up trees, or racing along the ground – all while attached to a string. You can also start working on look at that using real-life prey items. Try to find parks where you can maintain a “safe” distance from the squirrels. Again, the “Ready, Set, DOWN!” exercise will be helpful for working on teaching your dog to think when excited. The bottom line – it’s possible to train your dog with high prey drive to pay attention to you. 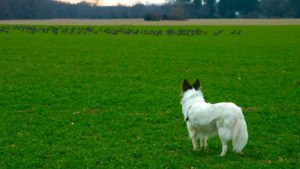 Using a combination of impulse control, recall training, and LAT techniques, your dog can learn to ignore prey items. Keep an eye on the Distance and Distraction levels, and make sure you’re succeeding often. If you or your dog gets frustrated, go back a few steps. Want more personalized help? Check out our different remote and online training options. Pingback: 5 Best Dog Harnesses for Hiking: Safe Canine Adventuring! This is so awesome! Thank you. Now I know what to work on next with my Husky X. He is almost similar to Konrad, but not to the same extent. I live in an area where all the dogs are practically hiking off leash but mine just can’t be because I loose him as soon as something exciting comes along. I think this will help a lot! I have a 5 yr. old German shepherd. She was in a puppy mill in California and was transferred to a kill shelter. Our organization in Omaha called HUGS rescued 3 dogs.. she has a very high prey drive including small dogs. Other than the high prey drive she is very friendly. Very difficult to walk her in our neighborhood which is loaded with small dogs. It takes all my strength to restrain her. Any thoughts. Ron, that sounds really tough. For the safety of the other dogs in the neighborhood, you may want to start conditioning her to wear a muzzle. I’d also recommend a head halter or front-clip harness so that you can control her better. Then, the Ready-set-DOWN game can help. Let me know via email if you’d like a private training session over video call for more help.